Trump’s Tax Scam is here. Republicans are gearing up to attempt to ram tax cuts for millionaires and corporations through Congress on the backs of the middle class and low-income workers. Well, we’re ready to fight it and we’ve built out TrumpTaxScam.org with resources, call scripts, and town hall questions to help you prepare for next week’s recess. BONUS: Tonight on Facebook Live, we’ll discuss Tax Policy 101, the Republicans’ latest moves, and answer your questions at 8:30pm ET/5:30pm PT. Like us on Facebook now and you’ll get notified when we go live! Thursday night at 8pm ET/5pm PT: join our webinar to learn how to fight systemic oppression and white supremacy. We’ll be joined by an anti-oppression trainer, Chris Crass, to discuss important tools to fight white supremacy in our communities. RSVP here for the webinar. Put pressure on your Members of Congress to demand an emergency relief package for Puerto Rico and the US Virgin Islands. Our government is failing the people of Puerto Rico and the US. Virgin Islands. Visit our website, read our explainer, and put pressure on your MoC to provide an emergency relief package and permanently rescind the Jones Act. Demand a clean DREAM Act. This Thursday, October 5th, marks an important deadline for DREAMers who’ve received deferred deportation: it’s the last day to re-apply. Thursday, and every day, we’ll stand shoulder to shoulder with immigrants to #DefendDACA and demand a clean DREAM Act. Visit standup.indivisible.org to take action to support DREAMers now. Trump is a foreign policy disaster. Escalating tensions with North Korea and Iran. Slashing the number of refugees allowed in the United States. Expanding the Muslim ban. These bigoted, dangerous policies make us much less safe as a nation. Read more on the Indivisiblog and learn how to put pressure on your Member of Congress to stop Trump’s warmongering. When we wrote our email to you last week, we were admittedly a bit nervous about TrumpCare. John McCain had said he was a “no” vote and Susan Collins was leaning no as well. We recorded a Facebook Live that night with Senator Warren and we were still gearing up for a big fight. Then everything changed. Everything changed because of you and how boldly, bravely, and creatively you exercised of your constituent power. We won. We defeated TrumpCare. 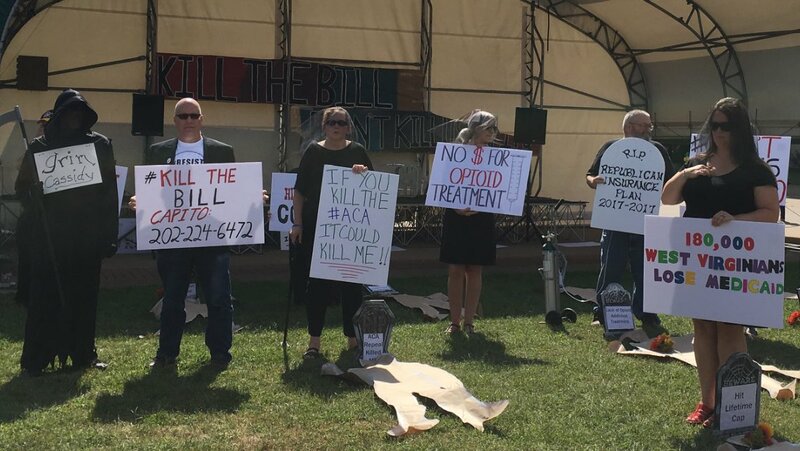 From die-ins to phone banks to good ol’ rallies, thousands from the Indivisible movement showed up for events for our National Day of Action to #KillTheBill (check out amazing photos from actions across the country on our YouTube channel). A funeral procession of grim reapers showed up to West Virginia Senator Shelley Moore Capito’s office to demand she vote “no” against #GrimCaskety (BEST HASHTAG EVER). 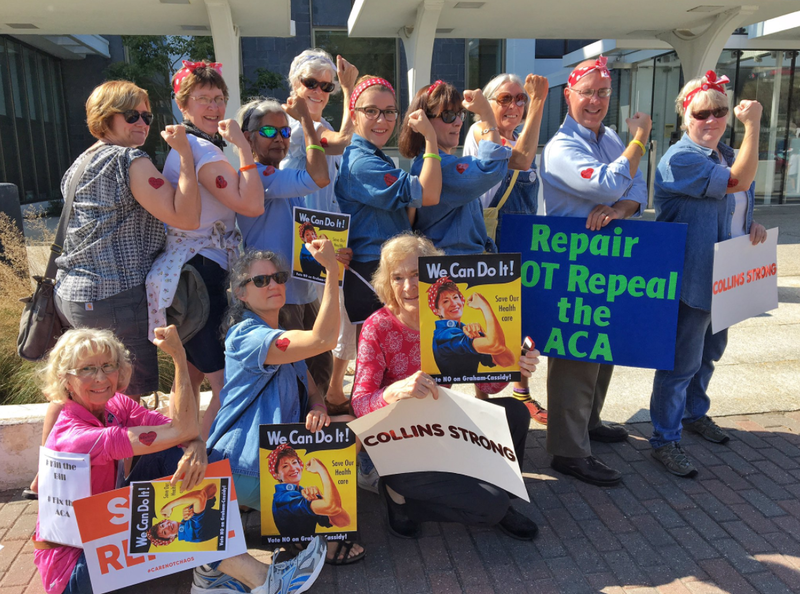 On Sunday, Indivisible MDI hosted a die-in, complete with tombstones, to tell Senator Susan Collins to vote “no” and #KillTheBill. Monday, they visited Collins’ office dressed as Rosie the Riveters (head to toe denim and red bandanas, of course!) to tell her “You can do it!” Hours later, Collins stated her opposition to Graham-Cassidy. 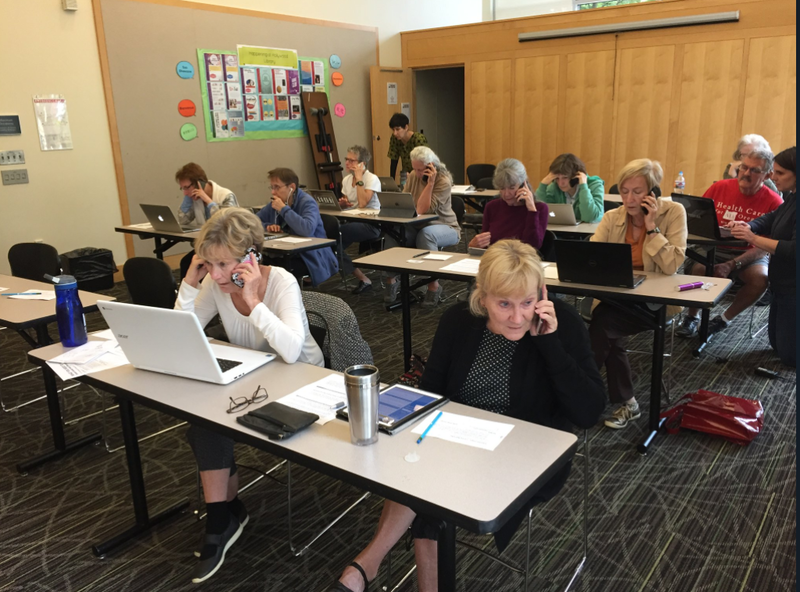 Indivisible Oregon hosted a phone bank using our blue state/red state calling tool to help connect progressives in red states to their Senators. In just 2 hours, 14 volunteers made 244 phone calls! Since the beginning of this fight, Indivisibles held more than 400 actions in your communities, 360,000 people used our TrumpCareTen resources to put pressure on their Senators, and you made more than 420,000 calls to constituents in red states to put pressure on key Senate targets. You made so much noise (how much?) that several Republicans have even announced their retirements including Rep. Jimmy Duncan (TN), Rep. Dave Reichert (WA), and Rep. Dave Trott (MI) — shout out to Indivisible East Tennessee, Indivisible W-08, and Indivisible MI11, respectively. And in a Friday night news dump, it was announced that Tom Price, Secretary of Health and Human Services, resigned after several failed attempts to repeal healthcare. This is a movement that shows up every. single. time. This is a movement that is creative, compassionate, funny, and powerful. This is a movement that doesn’t back down. This is a movement that grows stronger each and every day. This is a movement that has done the impossible time and time again. Now, we’re gearing up for the next big fight: Trump’s Tax Scam. After nine months of fighting TrumpCare, we can finally say that we’ve killed the bill. To be sure, Republicans may keep trying to resurrect the bill, so we have to remain vigilant. But you stopped Trump’s number one policy priority this year. That’s a huge, huge deal. And we can do it again. Tonight, we’ll discuss the latest details of Trump’s Tax Scam and how you can stop this bill just like you stopped TrumpCare! You asked for it and we listened — Indivisibles want more trainings, opportunities to share best practices in organizing, and to discuss topics that will contextualize our work in the broader movement space. For our first event in a new series of webinars and trainings, we’ll dive into a conversation about systemic oppression, white supremacy, and how these forces show up in our lives and our organizing with anti-racism trainer Chris Crass. There will be room for questions and discussion at the end. RSVP for the conversation here. The first step is the budget resolution. The House will vote on its budget resolution on Thursday and the Senate will mark up its resolution Wednesday and Thursday. Here’s the bottom line: these budgets cut critical services and would force deep cuts to Medicaid, Medicare, and Social Security down the road. All to give massive tax cuts to the rich and corporations. We’ve got you covered. Be sure to read our explainer (think of it like Tax Policy 101!) and be sure to use our resources, call scripts, and town hall questions to begin organizing. Congress must pass an emergency relief package for Puerto Rico and the US Virgin Islands. It is unconscionable that our government has failed to give the people of Puerto Rico and the US Virgin Islands (US citizens!) the same attention as it did the victims of Hurricanes Harvey and Irma. Read our explainer and ask your Member of Congress to provide an emergency relief package for the victims of Hurricane Maria and to permanently rescind the Jones Act, an antiquated law that has made it difficult for supplies to reach the Island of Puerto Rico. It’s time for a clean #DreamActNow. Last month, Attorney General Jeff Sessions announced that the Trump Administration would no longer support DACA, an Obama-era executive order that protected 760,000 DREAMers from deportation since 2012. This program allowed immigrant youth to work and take care of their families, live out their dreams, and no longer live under a constant threat of deportation. Now, the Trump Administration wants to change that. Show up at your MoCs office with your friends and ask them to support a clean DREAM Act. If you can’t make it in person, call, call, call! We want MoCs’ phone lines flooded with calls demanding a clean DREAM Act now. Escalating tensions with North Korea. Trump continued to tweet insults and threats at North Korea, including saying that North Korea “won’t be around much longer.” North Korea responded by saying it considers these statements to be a “declaration of war.” A war with North Korea would be devastating and completely unnecessary. But instead of diffusing the situation, Trump is making it worse. Slashing Refugees Admitted into US. On Wednesday, the Trump Administration decided to slash the maximum amount of refugees allowed into the US down to the lowest level in decades. This shows our international partners that we can’t be counted upon to help solve the global refugee crisis, contributes to right-wing fearmongering about refugees, and inflames racial tensions. Expanded Muslim Ban. Last Monday, the Trump Administration issued another version of his hateful and unconstitutional Muslim ban, this time with a blatant attempt to escape court scrutiny by throwing in a couple of non-Muslim-majority countries into the list. We’re not fooled: a ban is a ban. The ban emboldens bigots in the US and stokes anti-American sentiment abroad. Join us and our partners on 10/18 to declare: #NoMuslimBanEver. Again, congrats on the huge, historic win against TrumpCare. Thank you, as always, for standing Indivisible with us. Let’s keep winning. PS — You may notice something different about our website. We recently upgraded our URL from www.indivisibleguide.com to www.indivisible.org. Both will work for now, but if you’ve bookmarked our site please be sure to update it. And if you run into any problems, simply clear your cache (usually located in your browser’s preferences) and you should be good to go! Angel Padilla is the Policy Director, co-founder, and original co-author at Indivisible. As Policy Director, Angel oversees the policy team, which is tasked with demystifying Congress for the 6000+ Indivisible groups around the country. Prior to Indivisible, Angel led that National Immigration Law Center's federal immigrant health policy agenda. He also served as an immigration policy consultant at National Council of La Raza. Before that, he was a legislative assistant for Rep. Luis Gutiérrez (D-IL), advising on issues related to health care and the Affordable Care Act, among others.